NAPAVALLEY.COM - The first thing I think when I see The Village at Vista Collina is how beautiful it is. Located at Vista Collina Resort, the newest lifestyle resort in Napa Valley (and just across the way from acclaimed sister property The Meritage Resort), The Village is a palatial courtyard with a massive, manicured lawn, rows upon rows of giant shade umbrellas, and newly-built shops arrayed in an arc around it all. 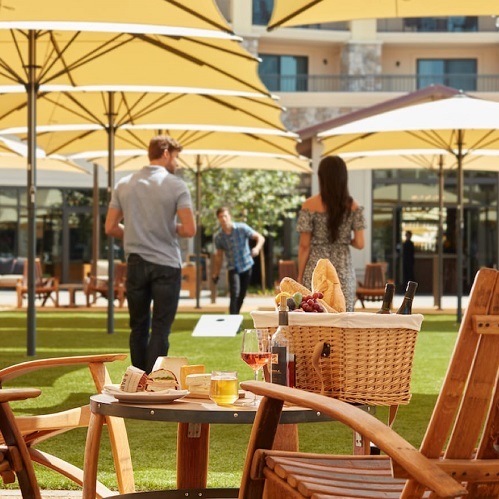 There’s a food and wine center, an upscale grocery, tasting rooms, lawn games, and, weather permitting, evenings of live music. The thoughtful curation of The Village begins at Fivetown Grocery, the upscale market smack-dab in the center of activity. It sells house-made pasta and sauces, smoked barbecue, freshly baked bread, as well as locally-made craft brews and wine. Chef Vincent Lesage, who leads Vista Collina Resort’s culinary program, creates beautiful picnic baskets for diners to enjoy on the lawn. It’s easy to dismiss picnic fare as cold food and lukewarm drinks, but this was the good stuff: charcuterie and cheese, sandwiches, fresh fruit, hummus, olives, house-made focaccia, individual serving-sized bottles of bubbly, and, the undisputed star of the show – a generous slice of glorious, decadent carrot cake to top it all off.